The problem I’m about to describe is probably partly my fault, but I’ll ponder it anyway. Why is it that people are still purchasing Nortel 3×8 phone systems? I mean, they are good systems and all, and I’m sure there are people who genuinely need them, but there are so many other options out there that are frankly speaking, pretty damn good options that are less expensive than Nortel’s offerings that, well, I’m a little amazed. Now, to be fair to my boss, he’s built his business on Nortel products. So, that’s what you’ll see on the homepage of the site. However, we also offer Avaya – which has made the leap to the front page as well. Some of the smaller systems are pretty good though, so I’d like to shed a little light on them. The first is anything by TalkSwitch. This is a great analog phone system with everything you can think of built in. Voicemail. Auto-attendant. The amazing “track-you-down-at-any-number-you-can-be-reached-at” feature (one of my favourites) plus a whole bunch more. It works with any analog phone, or you can buy TalkSwitch phones to go with the system. Oh – and if you purchase the optional VoIP module, suddenly you have a VoIP phone system at a very low price compared to anything from Nortel. TalkSwitch phone systems – ideal for small business owners. For those who are planning their data network to do data AND voice, there’s the really simple Venture IP phone system. Really straightforward – buy ONE Venture IP Gateway (supports up to four incoming lines). ADD Venture 480i IP phones anywhere on the LAN. The phones automatically find the gateway and configure themselves with an extension AND they find all the other phones on the LAN and configure themselves together. Add up to 200 phones on the LAN and you’re all set. This system also comes with voicemail, auto-attendant etc., which are EXTRA features on most mainstream phone systems. I personally think these phone systems are really great values for small business owners. Both are produced by well-established companies so there’s really nothing to worry about from a “fly-by-night” perspective. Just something for everyone to think of in the new year, especially if you’re just starting a business. This entry was posted in Uncategorized on December 28, 2006 by jjackson. I’ve been using a Chameleon 2001 headset for the past month or so. Overall, it’s done pretty well. I’m using it for a cellphone and my home cordless phones. The cellphone (Motorola V635) has a built-in headset 2.5 mm headset jack. The 2001 headset works fine with it, but the phone’s not so good for the headset. You can’t adjust the transmission volume, which means you sound REALLY LOUD when using the phone. Also, because the transmit is so high, while the noise canceling microphone tunes out a lot of stuff, even the stuff that’s muted gets sent through quite audibly. Not great. In addition, I found the cord of the headset acted as an antenna for the phone, so there was an audible hum on the line until I removed the antenna from the phone. Anyway, I attribute the problems more to the phone than the headset. I also use the headset on a couple of cordless phones I have at home and there, it performs flawlessly. The microphone’s better than what’s on the phones. One of my callers noted that my voice sounded clearer and had more bass to it when I put the headset on compared to when I was using the handset alone. I suggest though if you’re going to use a headset on a cordless phone that you get a cordless phone with a good range of volume adjustment. The VTech cordless phone I has the low volume setting rather high, even at the lowest setting. 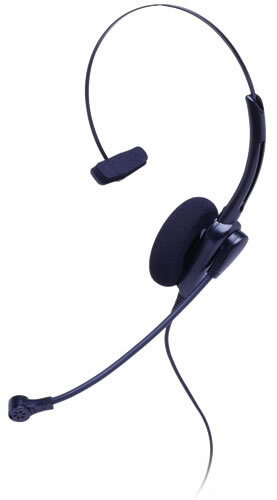 Sometimes it’s necessary to move the headset a little bit off the ear when speaking to a loud caller. On my GE cordless phone, I just lower the volume and no headset adjustments are necessary. In short, the headset works fine. The locking quick disconnect on the cord stays put as it should, even when my daughter’s pulling on it with all of her might, so that’s a neat feature. It’s durable, having gone from the car dashboard to the floor several times as well as being stepped on my my daughter a couple of times (the microphone boom only, fortunately – not the speaker). I use a cordless headset at work, so I don’t use the Chameleon there, but in the home environment, which is sometimes more hectic than work, it’s performing very well. So well in fact that my wife wants one too. Get your Chameleon 2001 headset by clicking here. This entry was posted in Uncategorized on December 22, 2006 by jjackson. Not sure what happend here, but the Nortel IP 2007 VoIP phone was missing in action from our site. Not just cute, but practical too! The biggest thing about them is the colour touchscreen and the added functionality that feature brings to the phone. Essentially, the IP 2007 combines the functionality of the Nortel IP 2004 VoIP phone and with the touch screen, gives you a ton more options. Many of the options depend on what version of Nortel’s communication servers you’re running, but if you have the support for it, you can get maps & directions from websites directly on your phone, see footage from your security cameras, give your staff information on guests in hospitality environments or send out company-wide bulletins over the phone. There are a lot of possibilities that can dramatically improve your organization’s efficiency by distributing information quickly to all staff with access to these phones. 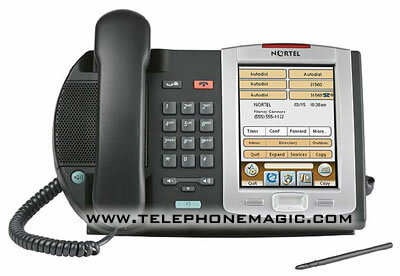 The Nortel IP 2007 VoIP phone – no longer MIA from the Telephone Magic website.